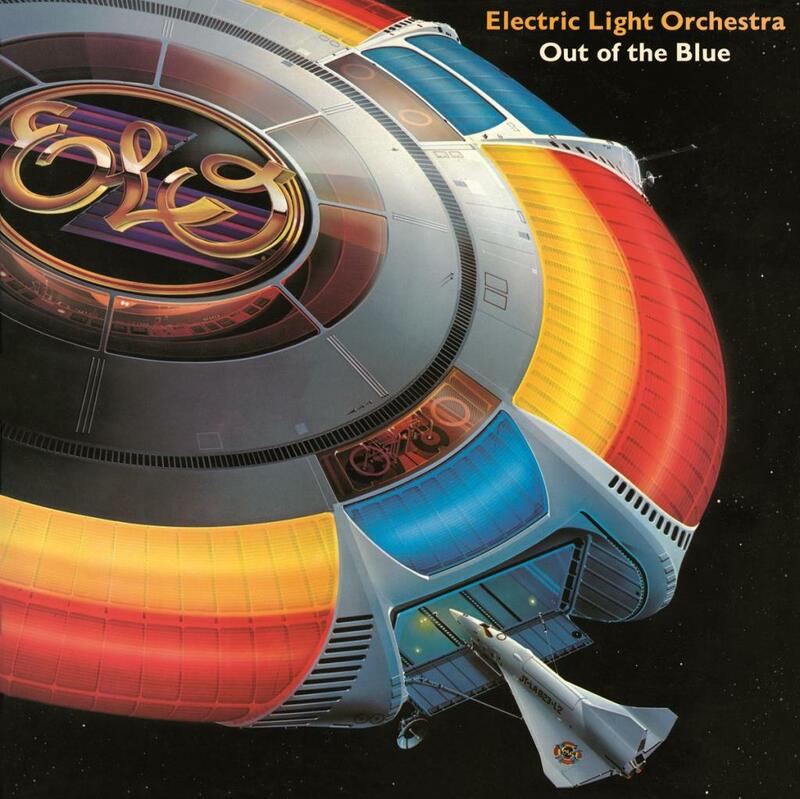 A couple of weeks ago I was rooting through the crates of used vinyl in my local record store and I found ELO – Out of the Blue, an album that, as a child, I had really wanted but couldn’t afford. As a double it was out of my price range (I would have been 11 at the time) but I did later manage to buy a copy of Discovery in 1979 from WH Smith in Didcot, which I had to take back because it jumped, and then take back again because the replacement jumped in exactly the same place. I eventually changed it for something else entirely, though I can’t remember what. Out of the Blue was harvested for singles and it is these I remember most, Turn To Stone, Mr Blue Sky, Wild West Hero, Sweet Talkin’ Woman and It’s Over, though they could probabaly have manage at least two more hits from album tracks they didn’t release as singles. I didn’t know that side three was a Symphonic Suite titled ‘Concerto for a Rainy Day’, which consists of “Standin’ in the Rain”, “Big Wheels”, “Summer and Lightning” and finally “Mr. Blue Sky”. I only found out when I looked it up on Wikipedia. ELO are perhaps not the trendiest band ever, and there was a time when people would list them as a Guilty Pleasure, but I don’t really believe in Guilty Pleasures when it comes to music, people can like whatever the hell they want and have no need to feel any guilt over it. Especially when it comes to ELO, as they have written some wonderful pop/rock songs and, for me at least, they are evocative of a period in my life when I was discovering music and really didn’t care what anybody thought of my choices. You can certainly hear how Jeff Lynne was influenced by the Beach Boys, the Bee Gees and the Beatles, in fact, he was mad about the Beatles and sometimes it feels that he’s spent a lot of his career trying to re-create Sgt. Peppers, perhaps Out Of the Blue is exactly that for ELO. The production is full and lush, filled with strings and is meticulously done, which seems to be a bit of a trademark for Lynne. Listening to the album again, after almost 40 years since it’s first release is quite wonderful as it doesn’t seem to have aged at all badly. The tunes are catchy, memorable and really well crafted. If you were only ever going to buy one ELO record I’d certainly recommend it. Although ‘A New World Record’ runs it close. Here is a full concert filmed in 2001, it has all the hits!